Design the city is a great complexity. This is a time when architecture is facing several challenges like sustainable and smart cities. Today, office buildings occupy a very high percentage of space after residential homes. They also need too much energy and then what will be the future of the planet. How the futuristic cities will look for? How to design them? In 2050 we will be about 11 billion including 7 billion in the urban area. These people will make significant pressure on the town and resources. Skyscrapers will be smart, they will both respond to spatial, energy, environmental, ecological and bioclimatic demand. It will contain urban growth while reducing their ecological footprints. The Cameroon is a first step test country. From tropical Africa with the second-largest forest wealth of the continent there are 300 species estimated at 22 million hectares. 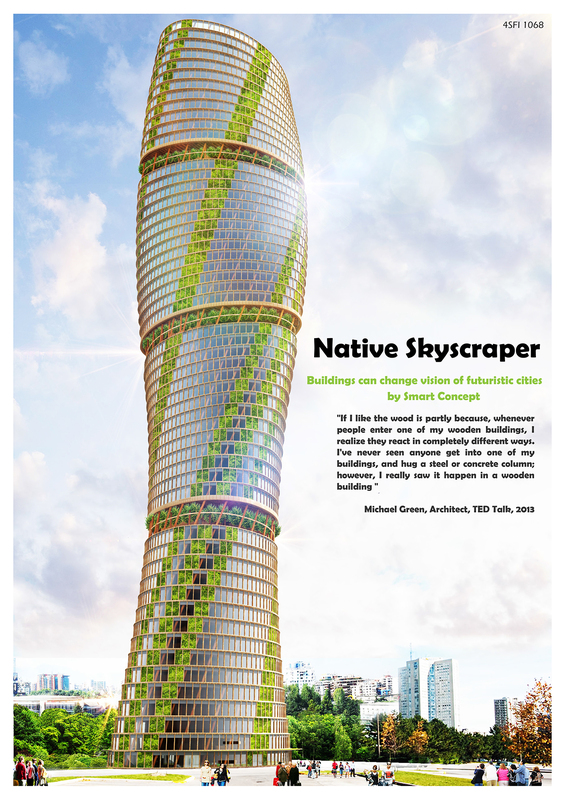 Native Skyscraper is built with experimental wooden structure. It is inspired by elements of traditional (Africa) and biomimicry architecture. It has a dynamic shape and seems like a Baobab. Project emphasises benefits of wood. The design comes from the history of the site. Art, sculpture and local culture is symbolised by the ovoid and amorphous structures. This site is the old city core. Biomimicry inspiration is the ‘Baobab: Tree of Africa’ which want to imitate nature. By its unique look, there are only 9 species of baobab tree on the planet. As a symbol, Baobab is Africa. Wood is the fingerprint of Mother Nature in our buildings, this fingerprint connects us to nature in our artificial environment. There are no two identical pieces of wood in this Earth and it is wonderful. The structural feasibility and sustainability are based on usage of wood. The natural wood transformed in glulam beams is very resistant to fire and allows crossing very far-reaching. In addition, the flexibility of these materials enables us several options profiles for the beams and columns. The columns are made of wood; beams are made of steel and concrete. The dynamic shape of our project allows great flexibility of spaces. Any specific areas of the project outside the core are unique in terms of aesthetics and comfort. All inflexible components are included in the core and the rest of space is a privileged user experience. The floors with the same function as Sky gardens show the nature and horizon in several visual and sensible plans. The integration of Precast Sanitary will be an advantage and allow better control and manage wastewater to the treatment plant and purification of our structure. This smart building concept is developed through natural materials, local and recyclable like wood. The main points as a whole: Marketable, serviceable, Economical Sustainable, environmental, Ecological and Social. Finally, sustainability also includes sensation of comfort and well-being by users. Sky gardens allow a supplement indoor comfort space and contribute in social interaction between users. They also help to create a connection with the city. Sky garden give a new face to the historic Centre dominated by the cubical building. Green walls incorporated into the interior space improve the microclimate.